Dice Control (Precision Shooting) | Be a Top Craps Shooter! Become a Dice Control Expert! Have you ever wanted to improve your odds of winning at the casinos? Do you feel that you don't throw the numbers you and your table needs to win big? IS your dice control as good as it could be? Let the Dominator help you achieve your goals. The casinos will ALWAYS try and favor themselves in craps. Take a simple example. The 6 comes up five times for every six times a 7 comes up. The casino gets its edge on a 6 Place bet by paying $7 for every $6 wagered. For a $6 player, the house loses five bets (total loss: $35) but wins six bets (total win: $36). The house wins $1 for every 11 decisions on the 6. But what if a player can learn how to play craps in a way that changes the game so that the 6 and 7 come up the same number of times, say, six times each? Now the casino loses $42 on the six times the 6 appears, but only wins $36 on the six times the 7 appears. Suddenly the dice controller is in the catbird seat. He has flipped the game in his favor big time! 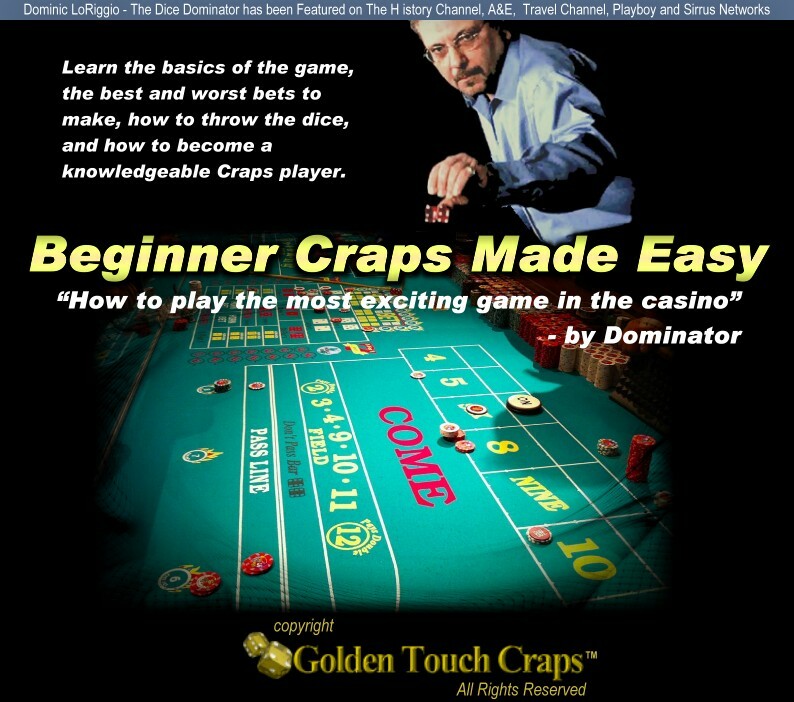 In this 2-minute video, Dominator explains how important it is to practice how you grip the dice. Learn to beat the casinos using physics and math and become an advantage gambler. Table position: Like a hitter in baseball, dice controllers must have their "spot" and "stance" for effective throwing. Where you stand is an individual matter but most dice control experts recommend learning only four positions so that, with practice, you can become proficient from any one of them. Setting the dice: If a pitcher wants to throw a curve ball, he places the ball just so in his hand, giving him the best chance that the ball will do what he wants it to. The initial dice-set that a shooter uses will, if the throw is dead-on accurate, determine which numbers are most likely to appear. Pick-up angle: They angle that you use to pick up the dice will determine whether they stay flat against each other, desirable, or tend to split, undesirable. Grabbing the dice: Coming in with the proper angle will allow a shooter to grab the dice without the dice moving or slipping. Both dice sides must be given equal force or the dice will split. Gripping the dice: Once you have the dice in your hand, how you grip them, the pressure you exert, how many fingers you utilize, will determine how much control you have over them. Delivering the dice: How you utilize your fingers, wrist and arm to make a soft, perfectly pitched throw is similar to how a pitcher will use his fingers, wrist and arm to deliver a baseball. Spin control: How fast the dice spin, how many revolutions they make before hitting the back wall, whether they are mirror images of each other or delayed mirror images will determine the effectiveness of the throw. Controlling bounce: The harder and higher the dice bounce, the tougher it is to control the outcome. The softer they hit the back wall, the less influence the back wall has on the dice. See Dom in action as he teaches this person dice control. From stance to arm, hand and finger control, he identifies the small things that will help him to better control his dice throw. If you are still struggling with your dice control and want to book Dominator for a private lesson, please get in touch. This article is copyrighted by Golden Touch™ Craps. Any reprinting without the express permission of Golden Touch Craps™ is strictly prohibited. Everybody was great. The class was the best.